This new patent-pending solution reinvents pulsed eddy current (PEC) and addresses what is possibly the greatest unresolved asset integrity problem in the industry: corrosion under insulation (CUI). Québec, Canada, March 7, 2016—Dedicated to electromagnetic inspection technologies, Eddyfi is thrilled to announce the launch of Lyft. This new patent-pending solution reinvents pulsed eddy current (PEC) and addresses what is possibly the greatest unresolved asset integrity problem in the industry: corrosion under insulation (CUI). 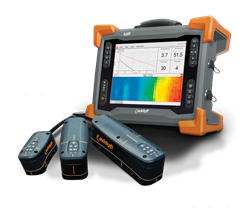 The portable, state-of-the art solution offers real-time C-scan imaging and fast data acquisition—with grid-mapping and dynamic scanning modes—to dramatically reduce inspection time and operator dependence. Lyft supports more applications than existing solutions, being capable of scanning through corrosion blistering and thick insulation with aluminum, stainless steel, and galvanized steel weather jackets. Current methods for measuring wall thickness with liftoff, without removing insulation, all have severe limitations. However, PEC offered the most versatility and potential for evolution. In developing a new kind of PEC, Eddyfi integrated automated software features (SmartPULSE™) that ease inspection, as well as an innovative, patent-pending technology redefining the way PEC signals are used by Lyft. Together, these features guarantee reliable and repeatable results. Three plug-and-play probes of different sizes for the right balance between wall thickness and liftoff complement Lyft. Finally, Eddyfi packaged the solution into a modern, portable instrument equipped with a large multi-touch display and embedded Windows® PC. Headquartered in the advanced NDT hub of Québec, Canada, with offices in France, the USA, and the UAE, Eddyfi focuses on offering high-performance eddy current and electromagnetic solutions for the inspection of critical components and assets. Eddyfi has customers in more than 50 countries in such major industries as nuclear, power generation, oil & gas, and aerospace. We also employ the world’s most renowned experts in the field of advanced eddy currents and electromagnetics, and they have the mission to push the limits of these technologies to new heights. Eddyfi develops the industry’s best performing and most reliable test instruments, acquisition and analysis software, as well as standard but, more importantly, specialized surface array and tubing probes. Eddyfi has the expertise, engineering, and manufacturing flexibility to supply fully integrated and specially made solutions that deliver superior performance to our customers.